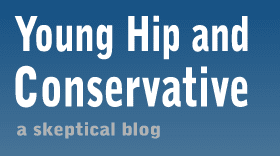 Young, Hip and Conservative: a skeptical blog: What's next, Mr. President? I've been mulling over President Barack Obama's recent announcement that he will not deport young illegal immigrants who meet certain positive qualifications. This is an important issue and I don't want to put this breezily. I think he's both power-hungry and condescending to voters. He's power hungry because he is willing to set horrible precedents to get what he wants. I want to end immigration restrictions and I think the country is better off keeping those young people here, but I can't support cheating to make that happen. It's no different then last year when he said the Justice Department wouldn't defend the awful Defense of Marriage Act in court. Are we to believe that presidents deserve the ability to arbitrarily declare which laws they will and will not enforce? What happens if a future president instructs the EPA to stop enforcing certain environmental laws with no checks and balances? This is bad news, even if one is on the same side of this issue. The is another cheap gimmick like last month's attempt to energize voters with a transparent election year conversation. In May he said he now supports gay marriage, but can't be bothered to do anything about it. Who didn't read that as an attempt to win votes and shift attention away from his broken promises to fix the economy? The O-man clearly doesn't think much of the intelligence of Americans. Now that he's pulled stunts to get gays and Latinos to show up to the polls in November, the next big group is young people. As a group, young folks were a big part of his supporters in 2008, but his failure to live up to his campaign speeches has lead to apathy. There's one easy way to continue his pattern and get them to vote. Obama could announce he is diverting resources away from the war on marijuana. He's been hawkish in the war on drugs and has alienated a lot of young people with crackdown's on pot, including medical marijuana. He told Rolling Stone, "I can't ask the Justice Department to say, ignore completely a federal law that's on the books." He said that would "nullify congressional law." Funny, he's said that before. We must be sharing the same mind! Tell me, what are we thinking, right now?